Shaping the future of wall panelling designs, panel by panel! Gary Wamsley represent’s premier manufacturers in the field of innovative wall coverings and surface materials thus providing clients with unsurpassed resource to compliment their vision in commercial, residential and hospitality design. DesignerWalls, dedicated to offering interior decorative wall panels with surface texture beyond imagination. We offer innovative wall panel solutions from exclusive European designers and manufacturers who use finest materials known in the industry. Natural products with modern twists to suit today’s design and architectural requirements with a healthy appetite for recycled products. These wall coverings include faux brick, stone, hardwood, slate, deco and a variety of other modern surface. Get in touch with us today and browse our products! 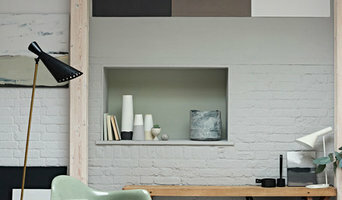 GoWallpaper.co.uk offer an impressive range of beautiful wallpapers from the traditional to the more contemporary. Amongst many other products, we also offer a fantastic range of paint colours from Little Greene and other well known brands. Our aim is to help you create your own perfect space throughout your home. With so many beautiful patterns and designs of wallpapers and wall murals to choose from today, you will be amazed with the end results. So whether it is throughout a room or as a feature wall, Bring your home to life! At the Panel Company we aim to deliver the broadest range of panels at the cheapest prices. From the value-focussed Décor Range to the very latest designs that challenge the look of tiles or stone we offer the entire range of what is possible. Cladding offers the ability to change your room in a quick and cost effective way, without the need for extensive preparation or grouting. Cladding can simply cover existing tiles and with a tongue and groove finish is within the reach of the amateur DIY enthusiast. With no grouting, maintenance is easy and your desired look will stand the test of time. Cladding has evolved over recent years to offer a wide range of finishes and looks from the traditional sparkle and plain tiles through to tile, metallic and stone effect finishes. With our unique Simply Cladding finishes we also offer the ability to laminate most surfaces, including glass and Perspex, in hundreds of different finishes and on surfaces that are capable of absorbing high intensity usage such as halls and kitchens. We also offer a huge range of bathroom furniture, stone and wood effect floorings and ceilings allowing you to complete your entire room. We can help you plan your look and uniquely offer a complete room discount bringing the price down to a level that you can afford. At What Wall Want we know what your home wants - pattern and colour! Wall's don't want to be lifeless, plain, and boring. They want to be wrapped in pattern and embellished with art. If wallpaper is the stuff that surrounds you, then it should be beautiful to look at, tactile, and personal to you and your home. Dressing a wall with wallpaper and wall art gives you the opportunity to personalize your space to reflect your personality. Different walls respond to different decoration. The What Walls Want team have over six decades of experience identifying the latest trends and Supplying wall decoration to satisfy all your needs. Shop What Walls Want on Houzz Explore What Walls Want on Houzz. We have a large range of UK Manufactured products for sale on Houzz including Wallpaper, Prints & Posters, and Home Accessories. Here you can browse our top products, categories, and collections. At Graham & Brown we know what walls want - pattern and colour! They don't want to be lifeless, plain, and boring. They want to be wrapped in pattern and embellished with art. If wallpaper is the stuff that surrounds you, then it should be beautiful to look at, tactile, and personal to you and your home. Dressing a wall with wallpaper and wall art gives you the opportunity to personalize your space to reflect your personality. Different walls respond to different decoration. The Graham & Brown team have over six decades of experience identifying the latest trends and designing wall decoration to satisfy all your needs. We've been making paint for over 200 years so you can be sure that every tin of paint is crafted with knowledge, experience and passion. We want to inspire you to choose the colours that you love and make your mark on your home with your personal colour choices. For interior walls, wood and metalwork. The exciting new alternative to radiator covers and cabinets. Easy to install in minutes. Ideal solution to cover radiators small or large and anything in between. Monument Interiors is your happy home of award-winning designer wallpaper. We host hundreds of unique collections handpicked from small independent wallpaper designers from across the globe, all united in their aim of adding a visually stunning final touch to the walls of your home. As experienced interior designers, helping you find the quality designer and feature wallpaper that’s right for your home is one of our key passions here at Monument Interiors. Every wallpaper design in our online store is available as a sample, and we are more than happy to advise on the perfect wallpaper brands, colours and styles for your home. Bespoke mural wallpaper. Photo upload, montage or select an image from 1,000’s on our image library. Printed by the UK’s leading wallpaper manufacturer in digital print. DIY easy to hang (paste the wall). Perfect results. Graham & Brown have a large selection of wallpapers to choose from, whether you want a damask for the living room, stripe for the kitchen or a floral for the bedroom, we are bound to have something perfect for your home. 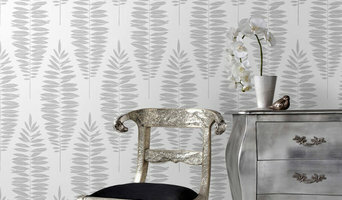 We also have a range of plain wallpapers to complement many of our feature designs. With a vast colour palette spanning soft blush pinks and deep purples to dramatic black and subtle beiges, you’re sure to find the perfect wallpaper colour to fit in with your theme. Forget messy tester pots. We provide ready painted A4 size sample cards in any Farrow and Ball colour of your choice! Just £2.99 each delivered to your door! Buy 9 get 10th FREE! Vivodecor brings a new and exciting way to decorating your walls. We bring your ideas to life. Choose your very own colours, designs and photos to produce something unique and special for your home or workplace. Our wallpaper and wall murals are made to measure to your wall dimensions, so whatever your wall size or shape we will produce it to fit. We are a British based company passionate about bringing new design and art to your walls. We are always looking to innovate and experiment with new trends and concepts that will transform your space, we think the ability to create a completely unique environment using the most beautiful artist creations is a great thing. We have an established manufacturing workshop and design studio in which we create and produce all of our products in house using the latest technology and equipment. Our friendly customer service team is always on hand to assist you, if you’d like to learn more about us then just get in touch. If you are planning on going simple with your walls, perhaps a crisp white or grey, then using Liverpool, Merseyside painters and decorators to finish the job to a high standard is still advisable. Not only will it mean your painted walls will be clean and precise, but it will also save you the time and effort. House painters in Liverpool, Merseyside will be quick and efficient at painting your rooms, and if you have a tricky outside wall or space that needs painting, specialist exterior painters are the professionals for the job. We all know it can sometimes be extremely tricky to get wallpapering right, too; lining up those strips of paper can drive some people round the bend, especially if it’s patterned wallpaper. But there are Liverpool, Merseyside wallpapering professionals that can do the job for you, and even regular painters and decorators will usually be happy to take on the work. If you want something more unique for your walls, wallpaper designers can create bespoke wallpaper patterns for your home or offer an exclusive selection for you to choose from; whether you want a geometric print, delicate birds and plants, or fabulous florals. Wallpaper designers should also be able to advise you on the best positioning of your wallpaper and how to apply it, so the advice won’t stop after you’ve bought the wallpaper. For those that can’t stretch to bespoke designer wallpaper, there are also plenty of wallpaper stores and suppliers that will stock a really wide range of designs to choose from. Shopping at wallpaper stores won’t break the bank and could still mean your home stands apart from those that have gone to high street names. Wallpaper designers and painters and decorators can do more than just throw a bit of paint or paper at the walls. 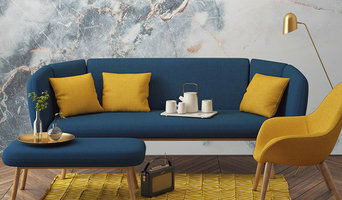 Once you start looking on Houzz you’ll find there’s a myriad of Liverpool, Merseyside specialists who can help you choose the right paint colour, design unique wallpaper patterns and even prepare your walls before paint or paper application. Paint and wallpaper companies have been established to offer bespoke services when renovating your home – they can consult you on the style you want, asses your rooms and design the perfect wall coverings, either working with paint and wallpaper designers or stores, or doing the work themselves in-house. Then, of course, they will apply your chosen wall covering and give your walls the appropriate finish. Some may handle decorative paint treatments, wall stickers, murals or patterns. You can search for specialist Liverpool, Merseyside painters such as mural, furniture or sign painters on Houzz, too, so if you have a piece of furniture you want to revamp or a space you want to give some special detail to, you’ll be able to find the right person for the job. You can also talk to your local Liverpool, Merseyside painters and decorators to see if they also specialise in any specific painting jobs other than standard wall painting and decorating – you never know, they may be able to paint beautiful murals, spray arty graffiti or be skilled at stencilling. Wall covering and paint contractors may also work closely with other Liverpool, Merseyside professionals such as interior designers, builders and stylists, too. Here are some related professionals and vendors to complement the work of paint & wall covering dealers: Interior Designers, Artists & Artisans, Curtains, Blinds & Shutters, Carpet & Flooring. Find painters and decorators or wallpaper designers on Houzz. Narrow your search in the Professionals section of the website to Liverpool, Merseyside paint or wall covering professional. You can also look through Liverpool, Merseyside photos to find examples of wallpaper and paint jobs that you like, then contact the professional who worked on them.